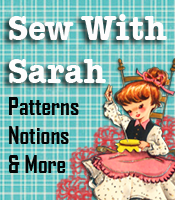 I’ve been sewing since the age of 8 and have been a pattern maker and designer since 1979, but I’ve never done this kind of sewing. 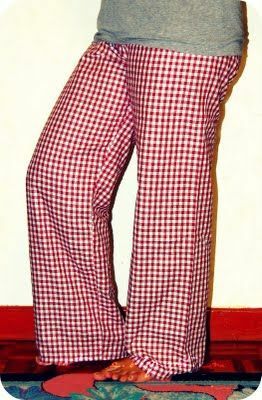 Sew Retro Chic has a REALLY good way to make a pair of lounging pajamas. She says she was “too lazy” to dig out her patterns, so just copied an old pair of lounging pajama pants and sewed them up. Here’s her tutorial on how to go about copying these lounging pajama pants. They look pretty comfy, don’t they? You could probably do the same with kids elastic waist pants – just as long as the pair you’re copying still fit them. Now IF you’re not the kind who feels comfortable just tracing around a pair of pants and sewing them up, but still need a pair of lounging pajamas or nightshirt, run on over to BigBeautifulPeople and check out the nightshirt and pajama patterns there. According to the comments people are leaving for our Holiday Designer Gingher scissors giveaway, it appears that pajamas are one of the most popular of all gifts that people are making for Christmas gifts. 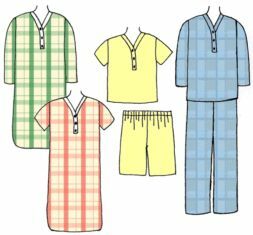 There is still plenty of time to get the patterns and start making some pajamas or nightshirts for your family. Can you help me? I haven’t sewn from a pattern in quite a while and set to making a Christmas nightshirt for my granddaughter but cannot for the life of me interpret the facing instructions for the front piece. It said to cut 4 of the two front facings and two for the neck. then sew them together. Do you have a tutorial on how to attach these to the front piecer? The directions are not clear at all. It looks just like your nightshirt above. Help~!